Most large American companies with publicly traded stocks hold their annual meetings, in which shareholders vote on various proposals submitted to them on proxy statements, between mid-April and mid-June. Although the voting results from these meetings are just starting to come in, the meeting agendas for a majority of these companies are now public because companies mail proxy materials to shareholders in advance. As of April 25, 122 of the largest 200 companies by revenues, as ranked by Fortune magazine, had announced their annual meetings and posted their proxy materials with the Securities and Exchange Commission. The shareholder proposals introduced at each of these companies are available on the Manhattan Institute’s ProxyMonitor.org database, which was launched in 2011 in an effort to aid understanding of a specific type of shareholder activism in which some investors have attempted to influence corporate management through the shareholder voting process. In a series of findings and reports, we have been analyzing empirical trends in shareholder proposal activity, the merits of which have been hotly debated in the academic literature. Shareholder proposals related to executive compensation remain at 2011 levels, but those related to corporate political spending and lobbying continue to increase and have emerged as the most frequently introduced class of proposal in 2012. 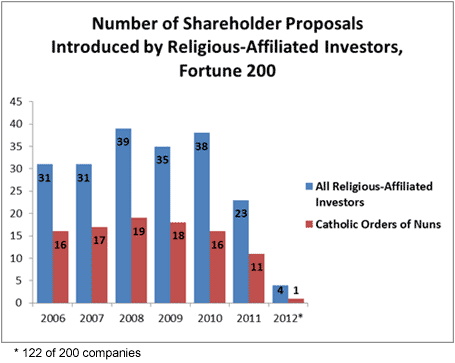 Shareholder proposals related to social or public policy issues, including environmental concerns, are below historical levels, in significant part because of a drop-off in activity from religious-affiliated investors, particularly Catholic orders of nuns. Labor-affiliated investors continue to be among the most active sponsors of shareholder proposals and continue to focus their efforts on companies and industrial sectors being targeted in ongoing union-organizing campaigns. Finally, the finding looks at some of the more contentious early contests, including those involving shareholder advisory votes on executive compensation. In my first finding, limited to companies that had filed proxy materials by March 15, I observed an apparent drop in shareholder proposal filings but noted that after “adjusting for the actual companies involved … the number of proposals does not vary markedly from that witnessed last year.” As expected, looking at the larger subset of companies to have filed by April 25, we see that 1.4 shareholder proposals per company have been introduced, the same rate per company as that witnessed through all of last year. 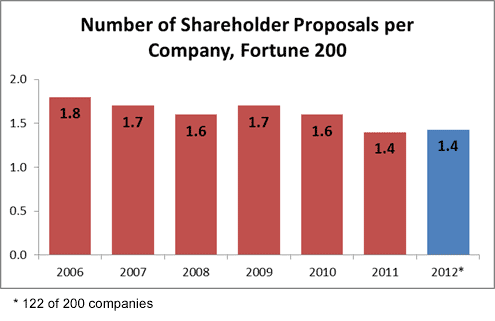 Continued decrease in shareholder proposals related to executive compensation.The overall number of shareholder proposals in 2012 remains below pre-2011 levels, when 1.6 to 1.8 shareholder proposals were introduced per company in the Fortune 200. This drop-off is mostly explained by the significant decline in the number of shareholder proposals related to executive compensation since 2010: from 2008 through 2010, between 28 and 30 percent of shareholder proposals related to executive compensation, before falling to 13 percent in 2010 and 14 percent so far this year. The principal reason that far fewer shareholder proposals related to executive compensation are being introduced today is that the most frequently introduced proposal prior to 2011 called on boards to submit executive compensation plans to a shareholder advisory vote, and such votes are now mandated for all public companies under the Dodd-Frank Wall Street Reform and Consumer Protection Act of 2010. Declining share of proposals related to social or political concerns.In addition to a continuing drop-off in shareholder proposals related to executive compensation, the percentage of shareholder proposals that focus on issues related to public policy or other social concerns is below that observed in recent history. 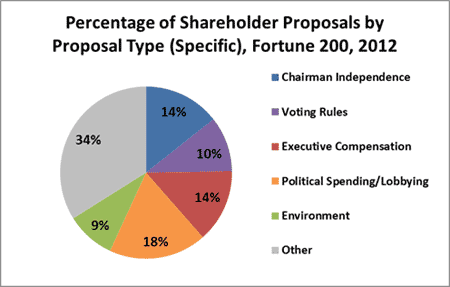 Such proposals constituted a plurality of all shareholder proposals from 2008 through 2011; but thus far in 2012, they are outnumbered by proposals related to traditional corporate-governance questions such as voting rules for directors, the independence of the board chairman, and rules for taking shareholder action outside annual meetings. The observed decline in social policy proposals may be a function of the companies filing to date but may also be attributable to a decrease in the number of shareholder proposals being introduced by religious-affiliated and public policy groups. 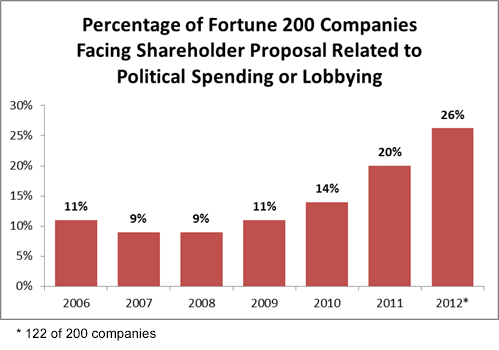 Increase in proposals related to corporate political spending or lobbying. 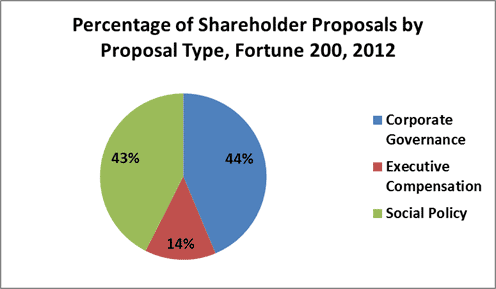 Looking at the composition of shareholder proposals with more specificity, a plurality of all proposals introduced to date in 2012 involve corporate disclosure of political spending or lobbying activities, followed by those related to executive compensation and those seeking to separate the positions of board chairman and chief executive officer. Other proposal types introduced at five or more companies include those related to the voting rules for electing directors, those seeking annual election of all directors, those seeking to empower shareholders to act outside annual meetings by written consent, those related to the environment, and those related to animal rights. That shareholder proposals related to political spending or lobbying outnumber those related to the environment more than two to one in 2012 is a departure from historical norms: from 2008 through 2011, environment-related proposals were the most numerous of all social policy proposals introduced at large companies. The drop-off in proposals related to the environment may be related to an observed decrease in proposals introduced by religious-affiliated and public policy groups. The increase in the share of proposals related to political spending or lobbying is notable and in keeping with a trend witnessed since the Supreme Court’s controversial 2010 Citizens United decision, which held that corporate political speech was protected by the First Amendment. In 2012, fully 26 percent of Fortune 200 companies to have filed proxy materials have faced a proposal related to political spending or lobbying, an all-time high. 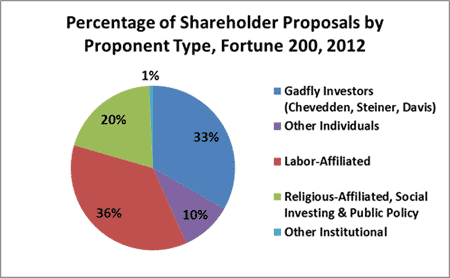 In keeping with recent history, a plurality of all shareholder proposals have been sponsored by individual investors (including “corporate gadflies” who introduce multiple similar proposals at several companies on a yearly basis), followed by labor-affiliated investors (chiefly pension funds for union retirees) and funds affiliated with a religious or public policy group or foundation, or those with an express “social investing” orientation. To date in 2012, only one shareholder proposal has been introduced at a Fortune 200 company by an institutional investor without a labor, religious, or policy affiliation or a social-investing focus. More significant role by corporate gadflies. Consistent with historical trends, the vast majority of shareholder proposals backed by individuals have been sponsored by a small subset of corporate gadflies. 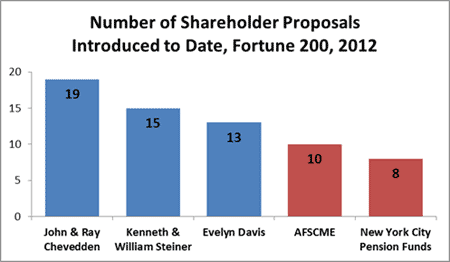 Some 76 percent of all individual-sponsored shareholder proposals were introduced by three individuals or families—John and Ray Chevedden (and the Chevedden family trust), Kenneth and William Steiner, and Evelyn Davis—and these investors have been the most frequent sponsors of shareholder proposals at Fortune 200 companies. This percentage is even greater than the historical two-thirds of individual proposals backed by the gadflies, even though Ms. Davis, 82, announced that she has scaled back her shareholder activism efforts in 2012. 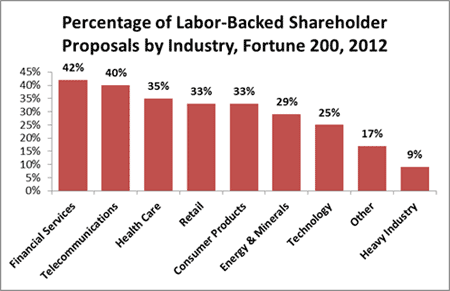 Only 10 percent of all shareholder proposals were sponsored by other individual investors. Decreasing activity by Catholic orders of nuns. Institutional investors with a religious, social, or public policy orientation sponsored 28 percent of all large-company shareholder proposals from 2008 through 2011, but only 20 percent thus far in 2012. While social-investing funds remain active—particularly Trillium Asset Management and Walden Asset Management, which have backed four and three proposals, respectively—there has been a decline in the number of shareholder proposals introduced by institutional investors with a public policy purpose or religious affiliation. In particular, only four proposals have been introduced in 2012 by religious-affiliated investors—a sharp drop-off from 2011, in which such investors were already less active than in previous years. To date in 2012, only one proposal has been introduced by an order of nuns, typically among the most active sponsors of shareholder proposals; this absence may or may not be due in part to the Vatican’s recent, well-publicized reprimand of U.S. nuns over perceived political radicalism. Labor unions active, focusing on organizing-campaign targets. Apart from the corporate gadflies, the union-affiliated pension funds for the American Federation of State, County and Municipal Employees (AFSCME) and for New York City public employees have been the most regular single sponsors of shareholder proposals in 2012. Other labor-affiliated funds introducing three or more proposals this year are the AFL-CIO, the International Brotherhood of Electrical Workers, the New York State Common Retirement Fund, the State of North Carolina Equity Investment Fund Pooled Trust, the Trowel Trades S&P 500 Index Fund, and the United Brotherhood of Carpenters Pension Fund. The combined number of proposals introduced by labor-affiliated funds exceeds even that introduced by the three corporate gadflies and their families. In my 2011 Proxy Monitor report, I noted that “labor pension funds and other labor-affiliated investors tend to concentrate their shareholder proposals in particular sectors” and that, in particular, labor-affiliated investors historically have tended to sponsor shareholder proposals at companies in service-oriented fields such as retail, finance, or telecommunications rather than those in manufacturing fields such as energy or heavy industry. These trends have continued in 2012: labor-affiliated investors sponsored the greatest share of proposals at companies in the financial services and telecommunications sectors and the lowest share at companies in the heavy industry sector. Given that 11.6 percent of manufacturing jobs are unionized, as compared with only 2.5 percent in financial services, the labor-affiliated funds’ sector-specific focus raises the question of whether their efforts are solely related to maximizing shareholder value or whether the funds are attempting to leverage the shareholder proposal process in conjunction with a union-organizing agenda. Indeed, the financial services and telecommunications sectors in general and several of the companies facing multiple labor-fund-backed shareholder proposals in particular—such as Bank of America, Citigroup, Wells Fargo, and Verizon—have been targeted in recent union-organizing campaigns. As noted in my first 2012 proxy season finding, four Fortune 200 companies holding early-year annual meetings—Johnson Controls, Navistar, Qualcomm, and Walt Disney—received appreciably lower vote totals in Dodd-Frank-mandated say-on-pay votes after their executive compensation packages were opposed by the proxy advisory firm Institutional Shareholder Services (ISS). These early results have been confirmed by two recent, independent studies, employing broad 2011 data sets, by researchers at the Rock Center for Corporate Governance at Stanford and a separate team of researchers led by Columbia’s Fabrizio Ferri. In the past month, three more companies have faced significant say-on-pay challenges: Bank of New York Mellon and United Technologies, which received 59 percent and 61 percent shareholder support, respectively, for their proposed executive compensation plans; and Citigroup, which was the first Fortune 200 company in 2012 to fail to receive majority shareholder support (45 percent). ISS recommended against the proposed compensation plan for United Technologies. Both Bank of New York Mellon (which in 2011 replaced its CEO) and Citi (which faced opposition to its plan from both ISS and the proxy advisory firm Glass-Lewis) faced significant union-coordinated protest activity at their annual meetings. In the coming month, as large financial institutions like Bank of America (May 9), JPMorgan Chase (May 15), and Goldman Sachs (May 24) hold their annual meetings, those following corporate governance should watch to gauge the effects of what promise to be similar efforts against proposed executive compensation plans. We also note that Mr. Chevedden, a purported owner of no less than 100 shares, or approximately 0.0001%, of our common stock and a stockholder proponent that sends out stockholder proposals to a large number of companies every year, has been sending stockholder proposals to the Company since 2001, none of which have received a majority stockholder vote. Instead, each time one of his stockholder proposals has been presented at an Annual Meeting of AutoNation stockholders, our stockholders have soundly rejected it. Further, at each of the last six Annual Meetings of AutoNation stockholders, rather than presenting the stockholder proposal himself, a representative of the International Association of Machinists and Aerospace Workers (the “Machinists”) presented the stockholder proposal from Mr. Chevedden on his behalf. It is not clear to us what the nature of Mr. Chevedden’s relationship is with the Machinists or what his or the Machinists’ motivations are in making stockholder proposals, but we do know that the Machinists have been attempting to organize automotive dealership service technicians, including some of ours, for many years. While we do not ascribe improper motivations to Mr. Chevedden or the Machinists, we do not believe it is appropriate to make stockholder proposals based on personal or special interests—such as a desire to organize Company employees—or grievances against the Company that are not shared by stockholders as a whole. The apparent coordination between Mr. Chevedden and labor union pension funds demands further study. Reports And Findings, Proxy Monitor., http://proxymonitor.org/Forms/reports_findings.aspx (last visited Apr. 27, 2012). Compare, e.g.,Lucian A. Bebchuk, The Case for Increasing Shareholder Power, 118 Harv. L. Rev. 833 (2005) with Stephen M. Bainbridge, Director Primacy: The Means and Ends of Corporate Governance, 97 Nw. U. L. Rev. 547 (2003). James R. Copland, 2012 Proxy Season Under Way: Shareholder advisory firm ISS serving as corporate America’s paymaster, Proxy Monitor, http://www.proxymonitor.org/Forms/2012Finding1.aspx (last visited Apr. 27, 2012). Copland, Proxy Monitor 2011: A Report on Corporate Governance and Shareholder Activism (Manhattan Inst. for Pol'y Res., Fall 2011), available at http://proxymonitor.org/Forms/pmr_02.aspx. See Copland, supra note 4, at 11. See Copland, supra note 4, at 8. The wealth-management firm Ram Trust Services has introduced a proposal to separate the chairman and CEO position at ExxonMobil. Joseph A. Giannone, Investor gadfly Davis calls it quits ... for now, Reuters (Apr. 19, 2012, 3:38 PM), http://www.reuters.com/article/2012/04/19/us-corporategovernance-davis-idUSBRE83I1CS20120419. These proponents were the Domestic and Foreign Mission of the Episcopal Church, the Presbyterian Church (USA), the Province of St. Joseph of the Capuchin Order, and the Sisters of St. Dominic. Catholic orders of nuns have been involved in some other shareholder proposals without assuming a lead sponsorship position, but they have unquestionably taken a lower-profile role in 2012. Wyatt Andrews, Vatican reprimands U.S. nuns over ‘radical feminist themes’, CBS News (April 20, 2012 7:18 PM), http://www.cbsnews.com/8301-18563_162-57418254/vatican-reprimands-u.s-nuns-over-radical-feminist-themes/. See Copland, supra note 4, at 10. See United States Department of Labor, Union Affiliation of Employed Wage and Salary Workers by Occupation and Industry (2010), http://www.bls.gov/news.release/union2.t03.htm. Cf. OIG Department of Labor Report, Proxy-Voting May Not Be Solely for the Economic Benefit of Retirement Plans, Rpt. No. 09-11-001-12-121, intro (March 31, 2011), http://www.oig.dol.gov/public/reports/oa/2011/09-11-001-12-121.pdf (questioning whether labor pension funds are using “plan assets to support or pursue proxy proposals for personal, social, legislative, regulatory, or public policy agendas”); Business Roundtable & Chamber of Commerce of the U.S. v. SEC, at 14 (D.C. Cir. July 22, 2011), available at http://www.cadc.uscourts.gov/internet/opinions.nsf/89BE4D084BA5EBDA852578D5004FBBBE/$file/10-1305-1320103.pdf (citing proposition that “unions and state and local governments whose interests in jobs may well be greater than their interest in share value, can be expected to pursue self-interested objectives rather than the goal of maximizing shareholder value”). Under the federal Employee Retirement Income Security Act of 1974 (ERISA), fiduciary duties governing employee benefit plan investment portfolios require that “in voting proxies. . . the responsible fiduciary shall consider only those factors that relate to the economic value of the plan's investment and shall not subordinate the interests of the participants and beneficiaries in their retirement income to unrelated objectives.” 29 C.F.R. § 2509.08-2(1) (2008). See, e.g., Mike Elk, Too Big Not to Organize: SEIU-International Coalition Try to Unionize the Banks, Huffington Post, July 29, 2010, http://www.huffingtonpost.com/mike-elk/too-big-not-to-organize_b_663940.html; http://articles.cnn.com/2008-12-08/us/bank.workers.union_1_bank-workers-suntrust-bb-t?_s=PM:US; http://www.ibew.org/articles/04journal/0405/p5.htm. See Copland, supra note 3. David F. Larcker et al., The Influence of Proxy Advisory Firm Voting Recommendations on Say-on-Pay Votes and Executive Compensation Decisions (2012), available at https://www.conferenceboard.org/retrievefile.cfm?filename=TCB-DN-V4N5-12.pdf&type=subsite. Yonca Ertimur et al., Shareholder Votes and Proxy Advisors: Evidence from Say on Pay (2012), available at http://papers.ssrn.com/sol3/papers.cfm?abstract_id=2019239. Patricia Sabatini, Protesters, shareholders vent grievances at BNY Mellon annual meeting, Pittsburgh Post-Gazette, Apr. 11, 2012, http://www.post-gazette.com/stories/business/news/protesters-shareholders-vent-grievances-at-bny-mellon-annual-meeting-630794/; David Henry & Ross Kerber, Citigroup loses advisory vote on executive compensation, Chi. Trib., Apr. 17, 2012, http://articles.chicagotribune.com/2012-04-17/business/sns-rt-us-citi-votebre83g15u-20120417_1_citigroup-chief-executive-vikram-pandit-shareholders; Jessica Silver-Greenberg & Nelson D. Schwartz, Citigroup’s Chief Rebuffed on Pay by Shareholders, N.Y. Times, Apr. 17, 2012, http://dealbook.nytimes.com/2012/04/17/citigroup-shareholders-reject-executive-pay-plan/; Service Employees International Union, http://www.seiu.org/ (last visited Apr. 27, 2012). AutoNation Inc., Proxy Statement Pursuant to Section 14(a) of the Securities Exchange Act of 1934, proposal 6 (March 26, 2012), available at http://www.sec.gov/Archives/edgar/data/350698/000035069812000029/a2012proxystatement.htm#s17ECAB8774304C3302D8708B54C431BB.